The first stamps of Greenland were privately produced parcel post stamps, issued between 1905 and 1937. These parcel postage stamps feature the Arms of Greenland. A mint condition example of the 1 Øre denomination is shown above. The majority of these stamps were used on parcels from Denmark or as postal savings stamps. These stamps, with Greenland village cancels, are actually very scarce. The use of parcel post stamps was discontinued in 1938, when new definitive postage stamps were introduced. The first definitive letter-postage stamps of Greenland were issued between 1938 and 1946. These definitive postage stamps featured the facing portrait of King Christian X on the lower denominations and a polar bear on the higher denominations. Three mint condition examples are shown above. Before 1938, there was little need for letter-postage stamps in Greenland, as letter-mail within Greenland and to Denmark was sent free-of-charge. Present-day Greenland is a self-governing state within the Kingdom of Denmark. The head-of-state is the Danish monarch. Internal self-government is managed by the parliament in Nuuk. Greenland's foreign affairs and defense are managed by the Kingdom of Denmark. Greenland is the largest island in the World, at over 836,000 square miles, but 80%, or about 660,000 square miles of the land mass is covered by an arctic ice-sheet. It is also the least-densely-populated country in the World, with a population of a little over 56,000, which lives along the Fjords and on the fertile lands along the ice-free coastline. Beginning in approximately 986, the East Coast of Greenland was settled by a group of Norwegians and Icelanders, led by Eric the Red. The new colonial settlements then came under control of the Kingdom of Norway and, later, the Kalmar Union. For unknown reasons, quite possibly through famine and repeated conflicts with the Inuits, these settlements vanished without a trace during the 14th and 15th Centuries. Denmark began asserting its sovereignty over the island, during the early 18th Century. A new Danish colony was later established around Godthåb (present day: Nuuk) on the Southwestern coast of Greenland. Under the terms of the Treaty of Kiel in 1814, Greenland was officially made a Danish colony. 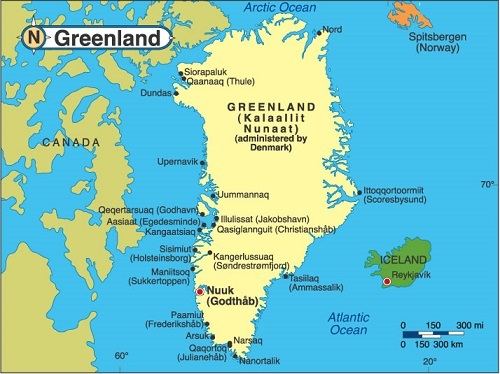 In 1953, Greenland was made a "county" of Denmark, and in 1979, internal self-government was established. Today, about 88% of the population speaks Greenlandic, an Eskimo-Aleut-Inuit language, with only about 12% of the population speaking Danish. Up until 1969 the postage stamps were inscribed in Danish. 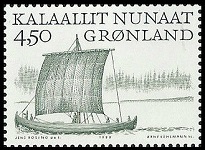 Postage stamps issued since then have been inscribed in both Greenlandic and Danish. 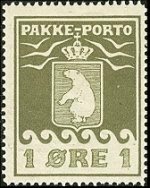 Links to historical articles and reviews of each of the postage stamps of Greenland will eventually appear at the top of the third column of this page.